Infallible tool for defining breed type - and judges. The Judges Rule Of Fives, repeatedly reprinted since 2000, is an infallible tool for defining breed type - and judges. As judge or breeder, observe any Group ring and note that no two dogs are identical and no two standards put equal emphasis on the same features of type. Working breeds may emphasize soundness whereas Toys stress esthetic beauty and Terriers want temperament that never quits. All are critical to Breed Type and it is by your knowledge of Type that you will be judged. Rules aside, it is Breed Type that you are duty-bound to observe, protect and preserve. Have you ever thumbed through photos of dogs from say, fifty years ago? Some represent advances in soundness or grooming but when assessing type, how closely did Saddler resemble the Fox Terrier of today? 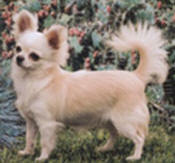 The Akitas of the Seventies could not win in the ring today but a Chihuahua is still a Chihuahua. Think. Even the Taco Bell dog was immediately recognized as a Chihuahua. Many judges take the easy way out – picking winners on soundness, faces, advertisements, or an opportunity to advance. They may get by, indeed, they may get a lot of assignments by making popular decisions but they will never be known as great judges. If anyone takes this personally, they should not be here. I'm nobody, just a messenger trying to deliver methodology learned from some of the greatest judges. I will give you Five Rules which properly applied, will gain the respect of breeders as well as your peers. These simple rules will help you find breed type, thereby protecting your integrity. You will have done your job. Hopefully this will help you judge every dog according to its breed standard and nothing else. There are many more "finer points" you can get hung up on later, but above all else, you should clearly demonstrate your commitment to the preservation of overall Breed Type. First Things First. As a judge, you have to quickly weigh many factors, the most important of which is the overall health, condition, and temperament of the dog. If it is sick, malnourished, unkempt, lame, can't be examined, or tries to bite, you will disqualify, excuse, or mentally eliminate it from consideration, depending on the situation. Breed Standard. You will then compare each dog to the AKC Standard. To do so you must constantly refresh your memory on every breed you judge because our minds play tricks on us, some of which can be embarrassing. One judge admitted that a good friend took him aside and said he had been awarding dogs with a very obvious breed fault and that people were talking. Re-reading the standard, he realized that something said by a handler-friend had seated itself into his subconscious but indeed, it was in direct contradiction to that breed's standard. The judge recalled many times, when weighing a hard decision, he had unwittingly selected for the fault instead of against it. Read the standards regularly but don't hesitate to refer to the breed standard in the ring. No one will fault you for that! Breed Seminars. Given the plethora of seminars and some of the people selected to present, you really do need to read the breed standards on a regular basis You should also bear in mind that presenters who have a certain problem in their breeding program tend to over-emphasize it beyond that which is conveyed by the standard, or if they settled for ignoring it, some presenters will minimize that fault in seminar discussions. If you have any doubts about something said in a seminar, ask the presenter for clarification. If you're still not sure, go ask two top breeders working in two different bloodlines. If they give you two different answers, well, you are on a quest! There are judging techniques not covered by AKC Breed Standards but which are very important to ring craft, particularly for judges crossing over into another Group. Protocol on how to approach and "go over" certain breeds. No matter how many pages you take home today, they cannot take the place of examining and observing real dogs. Michele Billings once admitted she was having a hard time “getting a handle” on Akitas. I suggested she talk to Roy Ayers, Virginia Hampton, Eleanor Evers, etc. A few years later she did the Akita National Specialty and drew rave reviews, even from those who won nothing. What higher compliment can a judge receive? Breed Character Is #1. When the dog enters the ring or is undistracted by the handler, note whether it carries itself with the correct attitude. A Bully will bounce; an Akita is dignified, purposeful; a Chihuahua may twirl or play; a Toy Fox will strut to the end of the lead and survey his ring. A German Shepherd will be majestic and confident as he surveys his surroundings. If you don’t know how the breed should act, go visit with breeders. If the dog acts tired, it could be the end of a long day but if the handler can't bring the dog around by sparring, baiting, or gaiting, you must disregard it because you are unable to assess breed character, which should be the first component of Type. It matters not what the reason (and handlers are full of excuses), it is a dog show and you are to judge them on the day. It may be a dog you adore but if it is showing badly, you will be seen as a fool if you put it up. You judge dogs, ringside judges you. It is a puppy? First show? Okay then be forgiving but don’t award it unless it shouts type and puppy audacity as in this Akita puppy! You will be doing no favor to the breed, the handler, or your own reputation. Even a structurally correct dog is a bad example if it fails to display proper breed character and personality. There’s always another day and another chance for the dog to convince another judge that it has correct temperament and type for its breed. Set the rules now. An Akita performing like a Minpin has a serious lack of Breed Character. A dog that droops or is bored is something other than a toy breed. A Chihuahua may shrink back from a stranger, a terrier that does so should be mentally eliminated. Sure there will be in-betweens but if you apply for the breed, you should know it well enough to judge the degree of un-typical behavior and its significance in that particular breed. A beautiful dog that lacks character misrepresents the breed. Therefore Character is the first Priority. A Havanese is not a Lhasa outline. An unclipped Poodle will still have that up-on-leg “poodley” profile that separates it from the Lowchen. If a dog in the ring makes you wonder if you would know its breed if you saw it on Park Avenue, for goodness sake, reject it. That is after all, why the public chooses a purebred. Silhouette then, is Rule #2. #3 is Head and Expression. Doesn’t matter if it is a head breed or not, the head is what owners look at every day. An Akita with a GSD head cannot possibly have the intimidating expression of a courageous hunter of bear, boar, and burglars but please, any suggestion of a chow scowl is a serious no-no. Size notwithstanding, a Chihuahua with Papillion skull couldn’t possibly have those huge luminous eyes so typical of the breed. So even if the standard fails to emphasize the head, it is an indispensable feature of breed type. It may take a keen eye to distinguish fine differences between the Toy Fox, Toy Manchester, and Minpin head but that is the mark of a great Group Judge. You have a duty to know and award the dog who acts like it’s breed, presents an easily recognizable profile, and whose head and expression define it as such. If you are down to the ribbon but find yourself confused by a super-sound Bullie with big eyes and a significant stop, remember rule #3. Movement - Soundness versus Type is a worn out debate but theres a reason its rule #4. Everyone knows you “can get a sound dog at the pound” but movement is indicative of a lot more than soundness. It can define breed purpose and lest we forget, that is supposed to define breed type. In many breeds, way of going is a critical test of correct conformation. Should a Peke move like a Pom? A Bullie like a Boston? Of course not, so beyond soundness, movement exemplifies breed type. It is okay to be a "movement judge" if you make clear what you are looking for instead of pointing at the greyhound with the best side gait or the chow with the most "reach and drive." If you aren't getting it yet, consider this. If the Collie moves like a Shepherd, it may be exciting but it is all wrong! Okay, so ringside will cheer for the big moving dog but does that make the Clumber moving like a Cocker better than the Cocker? You know the answer so remember you are the judge, not ringside. Common sense tells you that muscle dogs (Bull Terriers, AmStaffs, etc) should move like a weight lifter, not like a sporting dog! Do you want to be known as a “movement judge” or as someone who “really knows the breed.” It's your decision. Which is the greater compliment? More to the point, which is more important to preserving that breed? That is Rule #4 so disregard the cheering sections and show off your uncorruptible knowledge. Coat Type is #5 on this list because it constitutes an essential element of type in many breeds and may be a disqualification in many. It is often a deciding factor for both pet owner and breeder. Go beyond the Maltese or the Old English. Sure, they are uniquely coated but if you really know your stuff, you know even breeds with similar coat types have subtle but important differences. 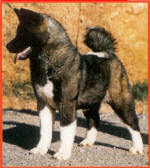 An Akita does not have the longer flatter coat of a Malamute but does have a stiffer, fuller coat than a Siberian. Subtle differences can only be determined by touch. Reading about coat does not allow your tactile senses to learn and record correct type for the breed. A Mini-Bull does not have the coat of a Staffie-Bull. Both will be short, flat, and glossy but the Bullie’s coat feels harder because the hair shaft is slightly thicker to offer just a tad more protection. While the Toy Fox Terrier’s coat looks like a Minpin’s, it is slightly smoother, as though the TFT was wrapped in tight-fitting satin. Each hair has a smaller diameter and tighter cuticle, and not to put too fine a point on it, a satiny coat is a finer point of type in that breed. As a Toy judge you probably know it comes from the I.G. In some breeds, coat can be the difference between survival and death or fitness for the job the dog was bred to do. In others, it is window dressing but if you know breed type, you must give coat a priority rating. The Sum of The Rules Of Fives? Easy. Add it up and exclude any dog that fails any two of these priorities. I say that because there are varying degrees of departure from the utterly correct, even in these five areas. If the dog waddles like a duck on the down-and-back, it is wrong no matter how beautiful its head, how perfect the structure, and how faultless its coat. Judge each dog against the breed's standard, not the competition. Test question: In the real world, if a dog catches your eye and excels in all but one of these priorities while the competition is of average quality with no glaring faults, which will you choose? If you dwell on your answer more than two seconds, you need to explore more information in Judges Education. It is disappointing when you have to pick the “best of a bad lot.” Is there a solution? Of course!! WITHHOLD ribbons. Be understanding, offer to discuss your decisions but be firm when there is no above-average quality. In the long run, it is a kindness not to mislead the novice into wasting more entry fees, or worse yet, taking the dog home to breed. If you have applied the “Rule of Fives” and found no dog in your ring that conforms to at least three of your rules, your duty is clear. The reason you have before you dogs that lack Breed Type is because too many other judges did not know or select for type. Or they have allowed handlers to think they will routinely give something in the ring the points.